Steamboat | Steamboat | Ecosign Mountain Resort Planners Ltd.
Ecosign has completed three major planning projects for the Steamboat Ski & Resort Association (SSRC). The Steamboat Springs Urban Renewal Authority (SSRA) was created by the City in 2005. By 2007, the City was moving forward with streetscape improvements to Ski Time Square and planning the Burgess Creek Promenade. Several private developers had major accommodation projects under construction or in the planning approval stages. 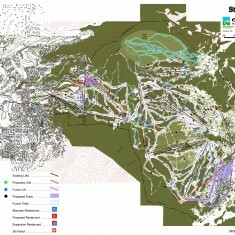 Ecosign was retained by SSRC to assist in the integration of these projects with the ski area and to explore development concepts for SSRC’s landholdings at the ski area base to create a Base Area Master Plan. As part of this work, Ecosign prepared the detailed grading plans for the installation of the Christie Peak Express and the revamped 20 acre beginner area in front of the gondola. In September 2007, Ecosign participated in the SSRA initiated transportation charette. 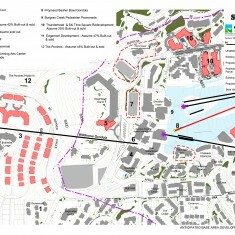 The impact of the potential people mover gondola landing at Gondola Square and its effect on the existing transit center was explored. The need for accurate data on transit movements was identified during the charette and Ecosign initiated a detail traffic data collection effort on President’s Day weekend in 2008. This data provided the foundation for understanding the interface between staging and skier arrival patterns in the base area and has greatly informed the Base Area Master Planning process. 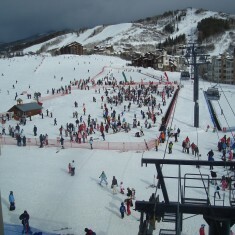 By 2010, many of the projects around the Steamboat Ski Resort base area that had been under construction in 2007 were complete. 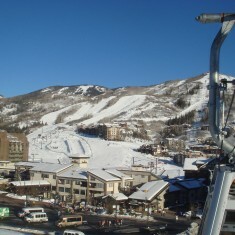 One Steamboat Place and the Wild Horse Gondola were open and the Ski Time Square commercial area had been demolished. 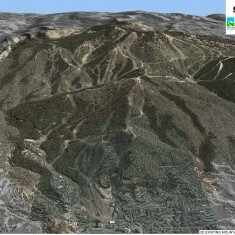 Ecosign was retained by SSRC to prepare an amendment to the Steamboat Ski Resort Master Plan taking into account the recent changes in the base area, as well as addressing the requirements for on-mountain improvements. The Steamboat Ski & Resort Corporation 2011 Master Development Plan Amendment was submitted to the United States Forest Service in November 2011 and is a conceptual blueprint for the next ten years. It includes plans for adding new lifts, expanding the trail network, adding and renovating skier service space (day lodges), increasing snowmaking coverage, increasing other recreational activities offered in both summer and winter, and additions or upgrades to infrastructure.